For the second year in a row Michelob Ultra has chosen Landmark on the Park as the venue to host their post NYC Marathon party for Team Ultra. Team Ultra consists of 95 runners who not only share a love and passion for running but also beer! Team Ultra participated in this year’s TCS NYC Marathon and finished the day with an exciting party at Landmark on the Park where runners could unwind and enjoy themselves. The event featured custom engraved Michelob ultra bottles for each runner, an “I ran 26.2 miles for beer” photo wall, a delicious spread of food and snacks so runners could refuel, and of course plenty of Michelob Ultra to go around. MMEink was proud to once again offer our event services to such an amazing brand and fun event. We would like to congratulate all of the runners on Team Ultra and everyone who participated in this year’s TCS NYC Marathon. Each year, people from all over the world gather to celebrate and honor their favorite SciFi shows and superheros at New York’s Comic con. This year MME had the opportunity to partner up with Johnny Walker and HBO for their new release of Johnny Walker White! Johnny Walker White is in celebration of the new season of “Game of Thrones”. Johnny Walker White or “White Walker” is an Icy refreshing new Whiskey with hints of Vanilla that separates if from the other Whisky’s in the Johnny Walker Brand. Using MME’s Punto space, we changed what was once a modern boutique space, and turned into a dark winter wonderland with whisky tastings and the opportunity to “walker” out with your very own NEW Johnny Walker White. Landmark on the Park has Manhattan’s best combination of beautiful environment, flexible space and affordability. Our facilities have attracted groups from all over the world. Only a few steps away from Central Park, in the center of Manhattan’s Upper West Side, we provide our clients with a prestigious location; a beautiful and spacious interior; excellent acoustics, lighting, and catering facilities. 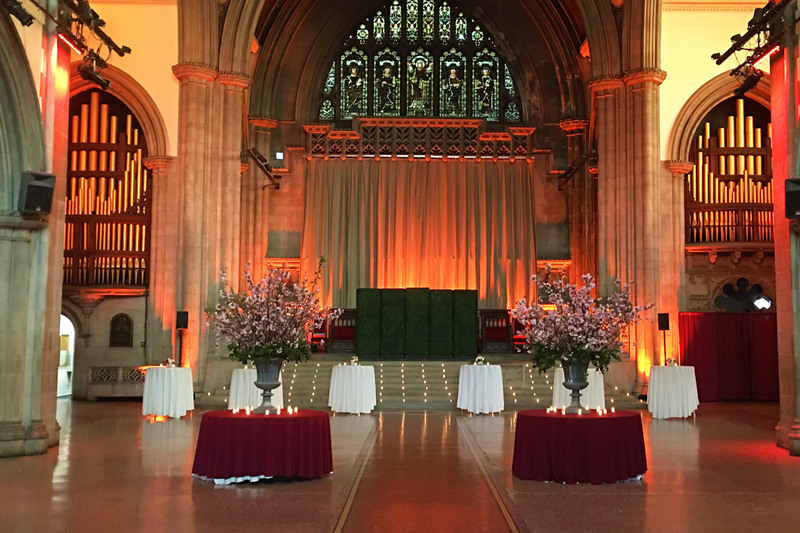 Our spaces range from efficient conference rooms to a gymnasium; from an intimate chapel to a magnificent neo-gothic main hall. Landmark on the Park has an outstanding reputation as one of the best event spaces in New York City. The Museum of American Finance provides a unique and magnificent event space for hosting corporate meetings, private affairs, weddings and nonprofit events on Wall Street. Located in the heart of NYC’s Financial District, the museum occupies three floors of a 1927 former historic bank. The Grand Mezzanine Banking Hall has retained much of its original architectural detail and boasts 30-foot ceilings, Palladian windows, and an entrance leading to a grand marble staircase. When entering the museum, you are greeted by a grand marble staircase. Let your eyes gravitate upward toward the impeccably crafted ceiling and oversized chandeliers. This is the museum’s Grand Mezzanine Banking Hall. This space has retained much of its original 1920’s architectural detail; from the 30-foot ceilings to its beautiful Palladian windows. The Banking Hall can host and accommodate a variety of events, which include seated dinners for 325 guests or a cocktail reception for 500 guests. The space can also be divided to your liking to create a more intimate setting for smaller events and meetings. Situated on the lower level, the concourse is designed to hold meetings, breakouts, classes, and events. The space can hold up to 200 guests and can be divided into six smaller rooms for breakout sessions. This level can also be used to host cocktail hours for clients utilizing the Grand Mezzanine for their reception. As a full-service Event Management & Hospitality agency with unique exclusive venues, MMEink frequently helps couples plan their wedding day. While organizing soon-to-be brides and grooms big day for next year, we’ve picked up on a pattern of frequent requests that will be big trends for 2019. Below is a list of trends that will be popping up next year. Much like how it is not uncommon these days for bridesmaids to not match their dresses in style or color, now the grooms side seems to not be adhering to traditional matching apparel. Don’t be taken by surprise if you see both sides of the bridal party walking down the aisle wearing different outfits. Much like how bridesmaids and now groomsman don’t need to match, couples are opting for place settings at the reception to have a great deal of contrast. All shades of purple are becoming more popular. Everything from lavender and lilac to periwinkle and violet is being requested in upcoming weddings. Not just floral arrangements either, purple is being used in lighting to set the mood of calmness but also of grandeur. A trend that seems to be picking up momentum is “Natural”. We are often asked to create designs of bringing the outside IN. Next year you will be seeing lots of greenery and brown replacing the use of traditional flowers as centerpieces, backdrops and other décor. Couples setting up the menu for the reception are having a hard time making decisions on what to order. A clever solution has been to decide to have smaller portions with the opportunity for their guests to enjoy more options. 2019 will be the year of more dining courses on a smaller scale. Instead of the traditional subtle pastel colors of weddings in the past, brides for next year are going bold with their color choices. You can look forward to weddings of 2019 to be saturated in bright colors. Turning into a big request for weddings next year, floral décor that hangs is not only a new way to handle centerpieces they also save table space. Steering away from gold being used in recent years. Brides and grooms to be are switching to using silver and chrome for accents, décor, place settings and more. New technologies such as video-mapping and drones are finding ways to be useful at weddings. It will not be uncommon next year to see couples employing the use of drones to video and take pictures of their big day from angles and heights never before available. The Brooklyn Cruise Terminal is a flexible location that offers large, unobstructed space. Located in Red Hook, Brooklyn on a 13-acre complex with breathtaking panoramic scenic views of the New York City skyline, Statue of Liberty, Brooklyn Bridge and Governor’s Island. The terminal is perfectly suited for large events including trade shows, corporate events, conferences, meetings, product launches, banquets, festivals, fashion shows, film shoots and concerts. The Brooklyn Cruise Terminal venue is separated by 3 distinct spaces, Lobby, Customs Hall and Warehouse for a total of 137,000 square feet. Punto | Four Spaces. Three Levels. Endless Possibilities. Make your next event extraordinary at Punto Space. A modern and versatile event venue in the heart of Manhattan that offers state-of-the-art amenities to support one-of-a-kind experiences for any type of event; social, corporate, art, fashion and more. Located in the heart of the Fashion District in New York City, this intimate event venue features an elegant glass façade that offers private, street-level access and the opportunity to create a unique experience that starts at the door. The contemporary, raw space combines capacity with intimacy. Four distinct spaces on three levels encompass more than 3,500 square feet. Custom configurations, a state-of-the-art audio-visual system, and full-service support provide endless possibilities for realizing your creative vision. MMEink was proud to host the 2018 BAM Gala at our Brooklyn Cruise Terminal event venue back in May. BAM (Brooklyn Academy of Music) is a multi-arts center located in Brooklyn, New York, so it only seemed right to hold the Gala here. The large scale of the Brooklyn Cruise Terminal was easily able to accommodate the 550 guests that were in attendance, where artists and partners were honored, special performances were held and guests could spend the evening celebrating with family and friends. Special guests included Jennifer Lawrence, Jeremy Irons, Darren Aronofsky and many more. On Monday, October 30, 2017 the Studio Museum in Harlem held the cocktail hour for their annual fundraising gala at the Museum of American Finance in NYC. A New York City cultural institution, The Studio Museum in Harlem is known for highlighting the work of some of the worlds most talented Black artists. This magnificent event brought out many of the Museums strongest supporters to partake in the evenings amazing festivities. The glamorous crowd was star studded and featured many talented and important men and women. MMEink was thrilled to once again provide our event services to the Studio Museum in Harlem for such an incredible gala. On December 15, 2016 Kaye Scholer hosted their last event as the Kaye Scholer LLP we all have come to know and love over the years. This year’s holiday event was extra special as it was the last time all the employees would spread their holiday cheer together as Kaye Scholer. On November 10, 2016 Arnold & Porter LLP and Kaye Scholer LLP announced the two firms have agreed to combine effective January 1, 2017 to become Arnold & Porter LLP. For the final celebration Kaye Scholer hosted a 70’s themed holiday event that kept the boogie going all night. What a great end to an awesome firm turning the page onto a bigger and brighter future.